This week Eric has been gone for 3 days at leadership meetings up in Hokkaido. Picking up Owen at yochien (kindergarten) on Tuesday, my friend Atsuko came over with her daughter and said they’d love to get together and play. So they both came over on Wednesday (every Wednesday yochiens get out early, before lunch time). They stayed until 5:30 pm – playdates are SERIOUS in Japan. Because most Japanese men don’t return home from their jobs until very late — 9 or 10 pm, or even later — Japanese housewives don’t seem to start thinking about dinner until 6 or 7… so afternoons often stretch long. I had shared in a previous blog entry (Golden Fasts) about the challenges of starting again in making new friends through Owen’s school…. I realized (through unwanted tears) that one afternoon that it will take time to know where each other’s spoons are kept in the kitchen, and more familiarity to be able to freely hunt for them without asking permission. I’m a pretty intentional person in relationships, but I recognize the importance of both time and shared experiences to deepen friendships to places of comfortableness. On Wednesday, Atsuko and I were drinking diet Coke together and eating oatmeal cookies that the kids had made. She told me that her husband has recently quit his current English conversation class in order to begin studying with Eric at his Saturday morning men’s class. We were sharing photos from our recent family outings. I was holding Olivia, when Annie suddenly stood up on the living room floor and a FOUNTAIN of pee started pouring out of her big girl pants. 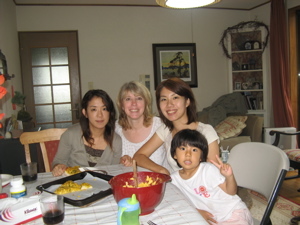 Atsuko, herself a mom of two girls, quickly stood up, picked up Annie under her armpits, and carried her to the shower. While I cleaned up the mess before Olivia could have fun in it, Atsuko showered off Annie, washed out her pants, and had found some pants and re-dressed her. While of course feeling slightly embarassed about all the mess, and thanking Atsuko for her swift help, I had to grin to myself. Finding each other’s kitchen spoons is NOTHING compared to showering down your friend’s daughter’s pee-pee. It’s happening. Silver friends…becoming more precious. Oh Sue… this post made me laugh and rejoice at the same time. That’s pretty intense – and really, it’s nothing compared to knowing where the spoons are kept. I’m praying for your relationships with the other moms from Owen’s class, and it’s great to hear how God is blessing them. As I was looking at yochien Moms this week, I was thinking how hard it would be to start new relations with this group. I am blessed at who God is bringing into your life. And you’re right–this beats knowing where the spoons are kept! I pray that you will continue to be courageous to keep on being intentional in these relationships. You’re an encouragement to me!